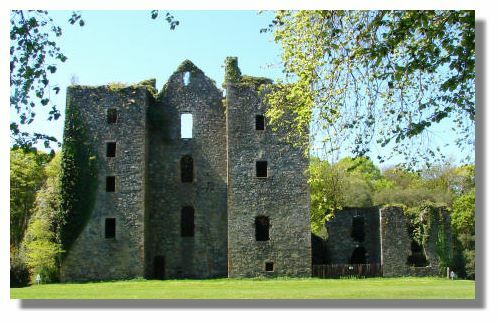 Castle Kennedy is about three miles west of Stranraer, Dumfries and Galloway, in south-west Scotland. The estate in which it stands has been owned by the Kennedys since 1482, when John, Lord Kennedy, was appointed keeper by King James IV. In those days, the castle was on an island and the present-day White and Black Lochs (separated by a narrow isthmus) were one area of water. The castle we see today was built in 1607 by John Kennedy, 5th Earl of Cassillis (pronounced "Cassells"), replacing the earlier stronghold. In 1677, the property passed to the Sir James Dalrymple of Stair, who added the north range to the existing building. Sir James was a distinguished lawyer who was President of the Court of Session. He was created Viscount Stair in 1690 and died five years later. His son, John, became 2nd Viscount Stair. He was also a lawyer who became Lord Advocate for Scotland and then Principal Secretary of State. It was the Earl of Stair who signed the infamous orders that resulted in the Massacre of Glencoe early on the morning of 13 February, 1692. When the events eventually became public, there was an enquiry and Stair was deemed to have exceeded his authority. But he was never brought to trial, and though he was forced to resign, soon returned to politics - and was one of the chief architects of the Act of Union in 1707. The 3rd Viscount (also John) became an army Field Marshall and an Ambassador to France. He began the construction of the wonderful gardens which are a feature of the estate today. In 1716, however, when staff heard of the imminent return of the 2nd Earl of Stair from France, they were airing the bedding in front of an open fire - and the earl arrived to find his home in flames. The castle was never re-occupied after that - another home was eventually constructed not far away, in Victorian times. Castle Kennedy Gardens extend to 75 acres of landscape, with terraces and avenues, overlooking the two lochs. They have an amazing collection of rhododendrons and azaleas and many specimen trees grown from seed. The Monkey Puzzle Avenue was planted in 1896 and there is a two-acre circular lily pond. 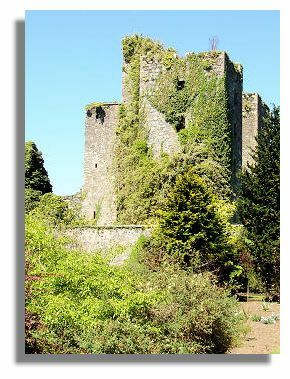 The walled garden (seen in the graphic on the right of this page) is overlooked by the ruined Castle Kennedy which keeps coming into view as visitors wander through. or go to the next castle: Castle Menzies.